Note bene: The DVD had mostly the O-1, but did mix in the O-2 and the OV-10. I’m no FAC pilot, but I did try to confine these shots to the O-1, but I could have missed a couple, especially when showing the interior cockpit shots. Where I can, I fill my amateur remarks. This article and photographs are reprinted with the permission of Lt.Col. USAF(ret) Edward Marek and his website, www.Talkingproud.us. I think this tail nr 72981, based on other video clips that look like they are of the same aircraft. I believe this is a video taken by the enemy. 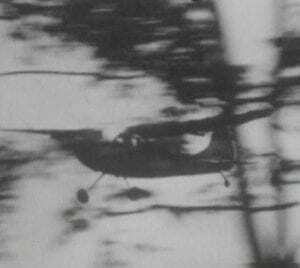 In the DVD, it was mixed with video of the enemy trying to shoot her down, and all enemy video was black and white, while most friendly video was in color. I am not sure whether those black blotches are flak or due to old video. 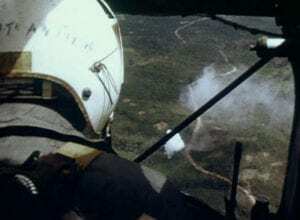 In the video, you see this pilot fire his white phosphorous smoke rockets, known as “Willy Petes” or “Wilson Picketts.” This clip shows where his Willy Pete hit. The beauty of this is you know there’s a fighter or two on his way to blast that target and bid the enemy adieu. The video sequence here is great. 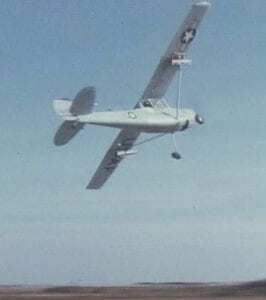 What you’re looking at is an O-1 flying to the rear and slightly above a formation of helicopters probably conducting an air assault. It looks like the helicopters are flying in a column of two. The helicopters will drop off their assault force, and the Dawg will likely stick around and help them kill enemy. Here you’ve got your one each Government Issue Bird Dog pilot climbing aboard what looks like tail nr 011976, with Snoopy nose art. 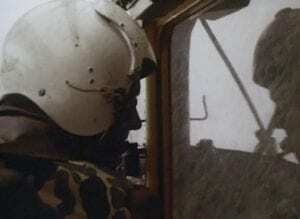 This pilot is just finishing putting on his helmet. This Dawg just took off and as soon as he got air under his gears, he started cutting a hard left. Once again, this could be enemy video. This Dawg is smoking in there at tree top level. We had to work hard to get a clip of him. 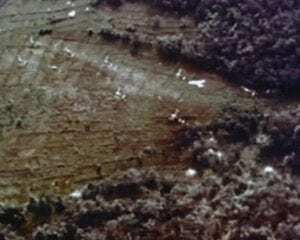 The video then shows enemy shooting, and then an O-1 pulling up and banking to the left. This is all in a section of the video where they are talking about the risks of getting shot down. This is a follow-on clip to the one above it. You can see that the O-1 is right on down there. 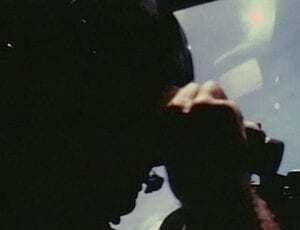 Some pilots talk about reaching out to touch the face of God. 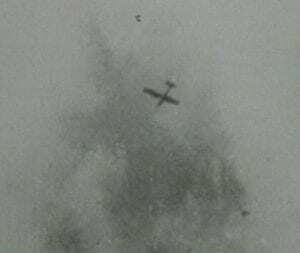 This pilot is talking about reaching out, grabbing an enemy by the shirt collar, picking him up and flinging him out so the enemy can go see the face of God. This pilot is doing his exterior pre-flight check, making sure he’s got an engine in there and that if there is one, that she looks nice and clean. Same pilot checking his rockets on the rail. 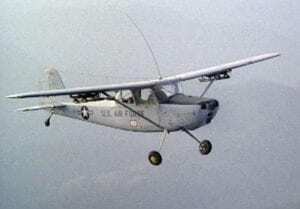 I think this aircraft carries the nickname “Little Puff.” Above the “US Air” behind the door, there is a paper attached to the fuselage labeled “armament.” The rockets were the armament, and were to be used to mark a target or scare an enemy. The only real armament the pilots had was their six gun and an M-16, unless they slipped something else in there, which some did to add a little zest to firing out the window at enemy. More on that later too! This is a neat section of the video. We have two Dawgs taxiing out together. The first aircraft is tail nr 78026. 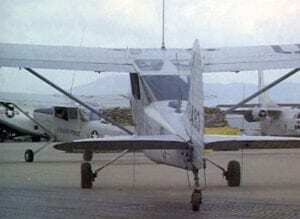 The second aircraft is tail nr. 62493. Beautiful shot. You can see the muzzle of his M16 standing there at attention. Everything had to have its place in there, as there was not much room. 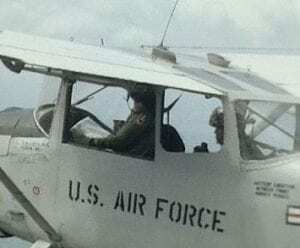 Greg Wilson, a former FAC pilot, was talking about something similar when this clip showed up. 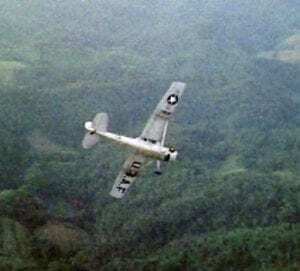 He said, “When you’re flying in a combat situation, you never want to fly the same heading, the same altitude, the same airspeed for more than four or five seconds at a time. This is tail nr 62597. I love this clip. 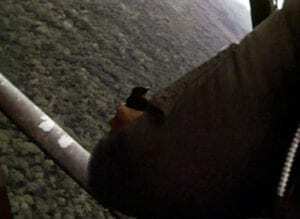 It looks the pilot’s left arm and his stick are outside the aircraft! Of course, they’re not; it’s just an optical thing. He’s in a left banking maneuver. If you watched the whole clip, you would see his window is definitely open because his flight suit is flapping in the breeze, often referred to as the Bird Dog air conditioning system. 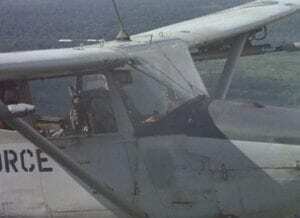 We are told by a former Dawg pilot that this pilot is flying with his left hand because he is preparing to throw a hand grenade out the window! 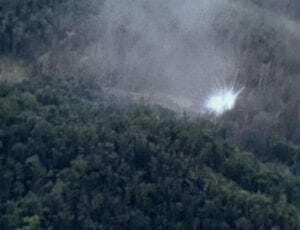 The pilots would toss grenades mostly to mark their targets when they ran out of their smoke rockets, though I’d wager some tried to get a few enemy as well. You might recall having seen old WWI photos, where a crewmember would drop small bombs by hand out the cockpit and over the side! 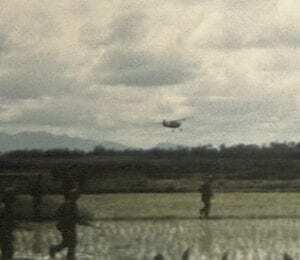 This is a nice shot because you see the pilot looking back at his observer, who often was a FAC pilot or an artillery officer, in this instance holding his binoculars. I believe this is a pilot looking through his binoculars on his own. The FACs did not always have an observer, and often had to search for targets with binoculars, fly the aircraft, read the map, jot down his notes on the window, talk to other aircraft he was controlling, and talk to ground forces he was supporting all at the same time. I am not sure this is the interior of an O-1, but I did want to show how the FACs kept track of everyone. 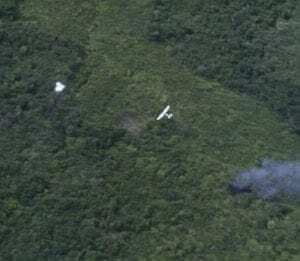 Retired USAF Colonel Jimmie Butler, a former FAC who has written a lot about the Southeast Asia war, has told us that this was standard procedure. 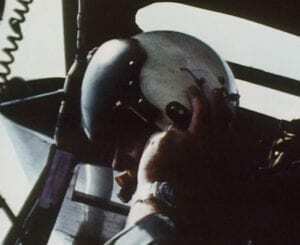 During air strikes, the FAC pilots liked to keep their heads out of the cockpit to better see the crowded skies and to avoid becoming fixated on their instruments. 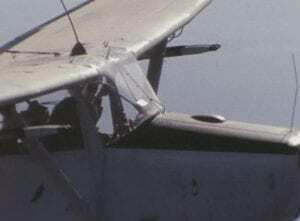 It’s also worth noting that a lot of FAC pilots liked to keep their windows open, listening for ground fire below. 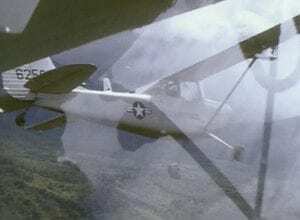 When over the Ho Chi Minh Trail, the pilots would log all their strikes on the window, then copy the information to a notebook on the way home for debriefing. 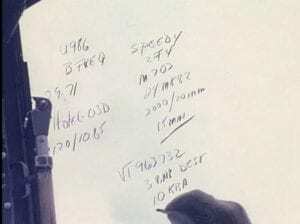 For every airstrike they controlled, they were supposed to include aircraft callsign, number and type of aircraft in that strike flight, ordnance expended by the strike flight, target coordinates in UTM, the percentage of ordnance in the target area and the percentage of coverage of the target, and the time the attack started and concluded. On our photo above, the “24 MK82” represents that 2 F-4 Phantom fighters were carrying a total of 24 Mark-82 500 lb. bombs. The “VT963732” is the target coordinate, in UTM language. On a map, there is a block of geography marked VT, and the numbers take you to the exact spot on the map, to a location about 100 meters square. Top right, it looks like Speedy is the flight of two F-4 Phantom fighters 15-20 minutes out. 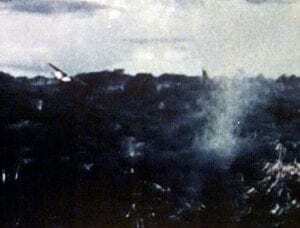 Below, it looks like three bunkers destroyed, ten enemy killed by air. This pilot looks like he’s right-handed, making this a little harder. In the video, you see several lefties and it looks a lot easier to get the writing down. If you’re a rightie, you would tend to write to the rear of the window; if a leftie, to the forward part of the window. The weather at the moment is good, the terrain is a little rough, but this Dawg is banking to the right and diving into the valleys you can see to his right, river valleys. If the weather were not so good, this would be tough. Furthermore, once he goes into a valley, he’s vulnerable to being shot at from the ridges. He’s going in there anyway. This is tail nr 623(9X) and he has an observer. 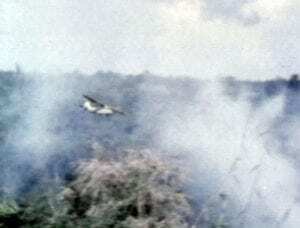 Here an O-1 pilot has just marked a target with a white phosphorous smoke rocket. Fighters can spot that easily and their task is to now hit their target. The O-1 has to make sure he gets out of their way as they come screaming through. Here again, a real nice shot. The O-1 is down there and has fired off a white smoke rocket. There is a fire burning to his rear which may have been struck correctly, or could have been a miss and the FAC wants the next run in farther ahead. Not sure. 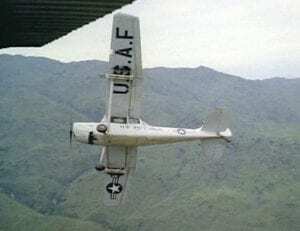 I believe this is a Raven O-1, flying a clandestine mission over Laos. 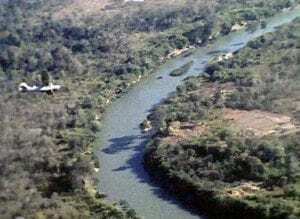 Note the aircraft is camouflaged. 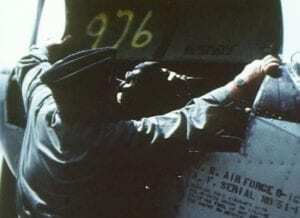 I believe the USAF marking on the rear fuselage was pasted on prior to launch. It could be taken off and a Laotian marking put in its place. That’s just some low level clouds in front of him. Again, you can see the muzzle of his M-16 standing tall to the right. On the back of his helmet, it reads, “8 PE Spare,” which we interpret to mean helmet number 8 from Personal Equipment shop, a spare helmet. 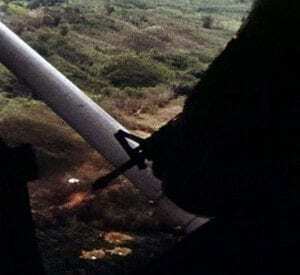 There is a section of the video that deals with providing direct support to troops on the ground engaged, one of the more anxiety-producing missions. You can barely make out an O-1 to the left coming in very low to take a look at fighting in the area of the smoke. This is a terrific shot. 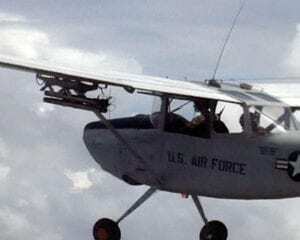 The Bird Dog pilot has taken out his M-16 and is firing out his window at enemy forces below. You can see the muzzle fire. 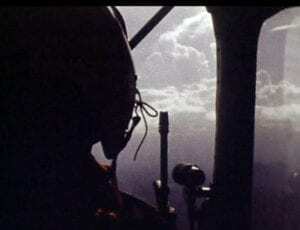 This section of the video is talking to the support provided by FACs to search and rescue missions trying to save downed air crew. 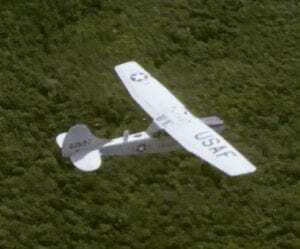 We’re not sure this is what this O-1 is actually doing, but you get the idea, streaking in low again. This Dawg has not been shot down. He just rolled over and started a dive to the deck. 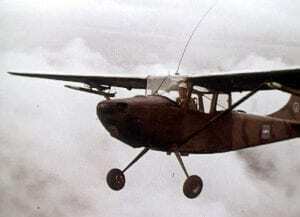 This O-1 was assigned to the 23rd Tactical Air Support Squadron (TASS) at Nakhon Phanom Royal Thai Air Force Base, known as “NKP.” On the door just aft of the wing strut, you can see a black something on the door. That is a black cricket stenciled on the door. 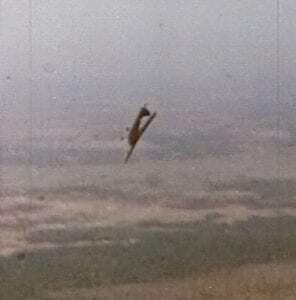 Some pilots thought it looked more like a grasshopper, but it was a cricket. It turns out that in early 1966, Lt. 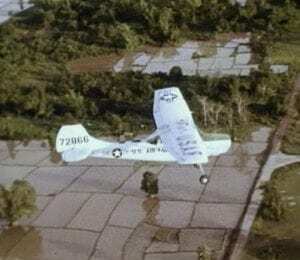 Colonel Robert L. Johnston was tasked to test using FACs over eastern Laos through which the Ho Chi Minh Trail passed, an area known as northern Steel Tiger. Planners needed to give the operation a name, so Johnston suggested using the name of his dog at home, Cricket. 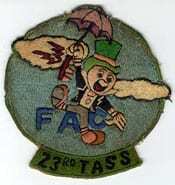 That was a winner, and the FACs soon became known as the Crickets, even though they might use other callsigns. Their initial deployment to NKP was very secretive in those days. 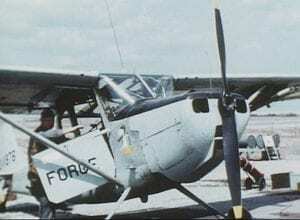 The 23rd TASS Dawgs did not have large USAF or other large insignias on the fuselage. As an aside, Capt. John C. Taylor sent a request to Walt Disney to help design the squadron patch, and back came a design that used the famous Jimney Cricket. 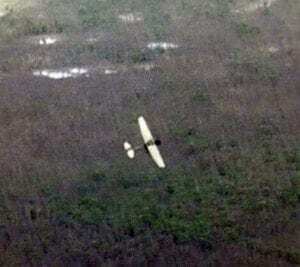 Returning to this photo, this aircraft is carrying the normal 23rd TASS armament load, a pair of 2.75 inch folding fin, white phosphorous marking rockets under each wing. 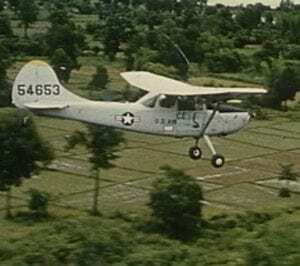 The areas the squadron covered over Laos, especially over the Trail, were very dangerous and the squadron suffered early losses in 1966, so they began flying in pairs. As a result, all together they had eight marking rockets while over the Trail, which usually lasted about an hour on a three hour mission. 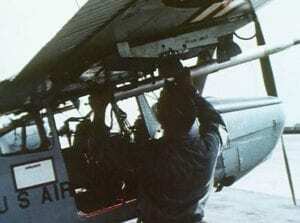 Note the metal tube in front of the windshield, on top the fuselage. 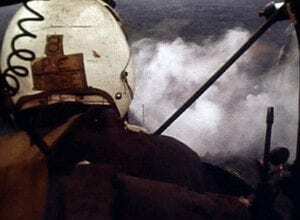 That was the pilot’s “gun sight.” He would make a grease-pencil mark near the center of the windshield, inside, and line it up with this tube to aim the rockets as he rolled in on the target. Hi tech, no, GI ingenuity, always. Colonel Butler has mentioned to us that he saw one of these tubes hanging on the wall of a FAC’s quarters. It had a V-shaped indentation that had been caused by a bullet hitting the tubing. 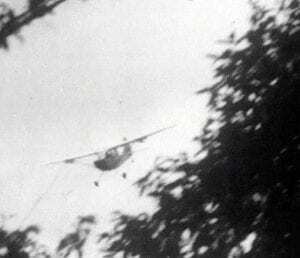 Figuring the FAC flew at from 80-100 knots, and estimating the distance between the tubing and the pilot, you quickly conclude the enemy gunner damn near got him.